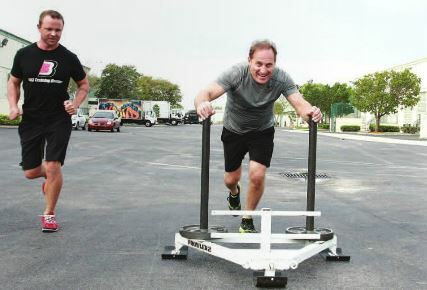 Above, fitness expert Billy Beck trains Park West Gallery founder and CEO Albert Scaglione on a “prowler.” Photo courtesy of Malibu Chronicle. Park West Gallery founder and CEO Albert Scaglione has been transforming the fine art world for the past 45 years by bringing artwork directly to people through two galleries and on multiple cruise ships worldwide. He is also in good enough shape to practice two forms of yoga, perform squats with 135 pounds of weight and finds time to devote to daily prayer. People may wonder how he does it, and part of the answer comes in the form of a disciplined routine that involves both spiritual and physical wellness, aspects of which he recently shared to help inspire others. Overall, Scaglione’s advice is to not give up on having a consistent routine. Born in 1939, Scaglione said being old is only a state of mind and point of view. He demonstrates this with a schedule that includes travel to Park West Gallery’s Michigan and Florida locations, and for the past 15 years has committed to maintaining a fitness regimen. Scaglione’s routine includes strength and cardio workouts at his home gym and while traveling, even if it’s doing exercises in his hotel room. Scaglione also practices Bikram and Ashtanga yoga, saying the flexibility they provide is a nice complement to his strength training. He said he tries to work out daily with one or two days off in between. Because of this, he puts great emphasis on a warm-up, saying it sometimes last as long as the actual fitness routine. His diet is rich in protein, eating four or five smaller meals each day and washing it down with plenty of water – around five to six liters a day. He said he’ll indulge in the occasional alcoholic beverage, but keeps it to a minimum when he is training. On his off days, he cuts down on carbs. 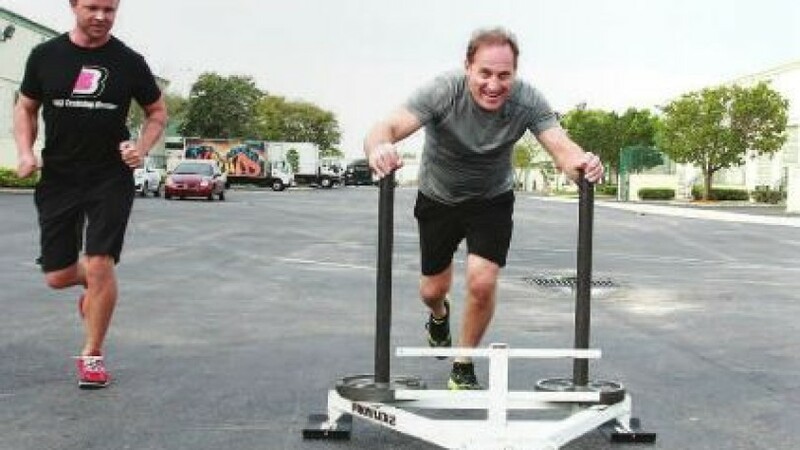 When in Miami, Scaglione trains with fitness expert Billy Beck. He adjusts Scaglione’s workout schedule to coincide with his travel plans, but has him performing many of the same exercises that NFL athletes use. In an article published in Malibu Chronicle magazine, Beck praises Scaglione’s commitment. “My greatest challenge isn’t motivating Albert to work out, it’s getting him to stop,” Beck told the magazine. In turn, Beck said the questions Scaglione asks gives him a “mental workout,” and he is inspired by the entrepreneurial advice and tips they exchange. “He’s the type of person I’d like to be when I’m his age,” Beck said. Scaglione practicing yoga. Photo courtesy of Malibu Chronicle. Prior to any business or fitness, Scaglione starts his day on a spiritual note, waking up and dedicating an hour to prayer. Although his prayers involve scripture and structure, he claims he doesn’t know how to pray. With that in mind, though, he prays for guidance in his prayer. “Just because you don’t know how to pray doesn’t mean you don‘t pray,” he said. He said he even prays for any enemies he encounters in life. He said meaningful prayer, no matter who it is for, ultimately results in a desire for peace.